Looking back to Brides The Show 2016 in London last October - Brides magazine launched the official catwalk video today: an amazing parade of the best designer dresses, and we were really proud to show with them! "Chances are if you are looking for luxury outfits for your little flower girls and page boys, you have come across Little Bevan. If you haven’t, I am sure you will want to take a look at these exquisite designs in more detail. Sarah Colfer first presented the designs from Little Bevan to brides to be at The National Wedding Show in November 2004." Style & the Bride was only too happy to catch up with Sarah Colfer from Little Bevan to discuss amongst other things the ages she caters for, how long it would take to create a bespoke outfit and her new styles for 2016. Sarah, welcome to Style & the Bride. What is the story behind the name? I grew up in what I describe as a ‘Blue Peter’ family – in that our mother encouraged us to create all sorts of games, toys and clothes! She kept all her amazing clothes from the ‘50s & ‘60s and we quickly learned to tweak these to suit ourselves. Sadly she died when I was still young, and so Little Bevan is named after her, in memory of her gentle, artistic spirit. I am totally self taught, apart from basic school sewing classes! I have learned all invaluable skills ‘on-the-spot’ while working for small businesses after I graduated from University (great fun, not very useful!) and especially during my time at the luxury womenswear designer Amanda Wakeley. What made you decide to launch the company? 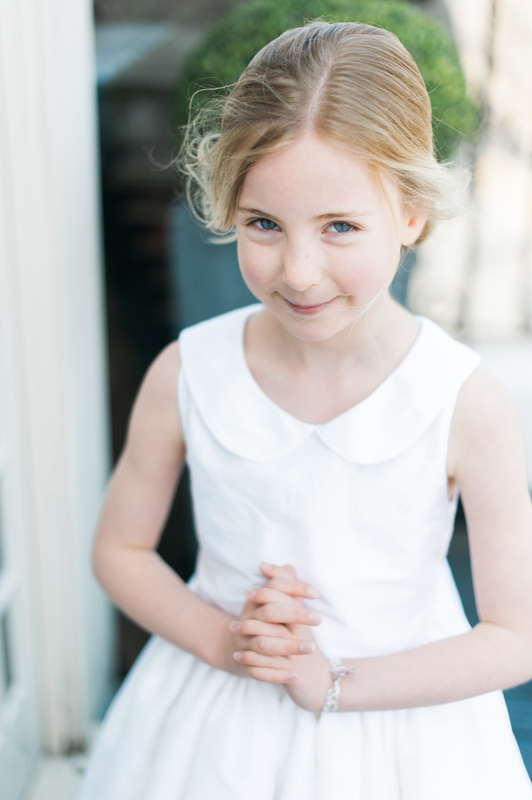 While running the bridal room at Amanda Wakeley, I was always asked for good suggestions of where to find lovely dresses for flower girls, to suit the style and quality of their bridal gowns. At that time, it seemed to be a very under-supplied niche in the designer dress world, and I always wanted to run my own independent business. Do you attract a particular kind of bride? We attract a discerning bride who really cares about every detail for her perfect wedding; who is looking for children’s outfits to enhance the style and quality of her own bridal dress – clothes to treasure for the children who are most special to her and the wedding family. Do you think there is a signature Little Bevan look? My designs have a delicate touch, and an elegant silhouette, with signature layering of sheer organza, soft silks and chantilly lace, often using tonal colours. There is a quintessential ‘englishness’ to the styles, which are inspired by the luxury and romance of historical costume, and my love of classical art and literature. Please let me know the ages that you cater for. We design for babies, girls, boys, tricky teens (and tomboys!) and young adult bridesmaids too. I began with just making children’s clothes, but now we cater for all ages, so that a bride can have a beautiful continuity of style and fabrics for all her attendants’ outfits. It can be difficult to find a ‘grown-up’ dress and outfit for a 10 year old bridesmaid and pageboy. What do you suggest? 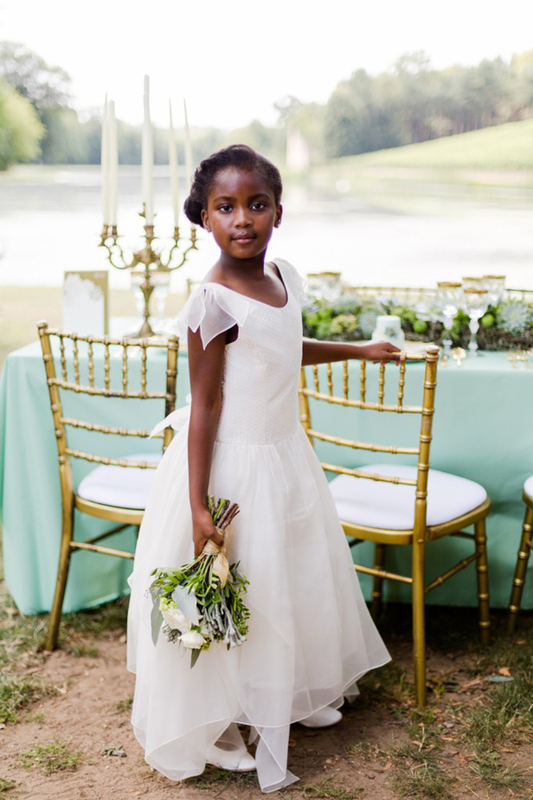 It is important to acknowledge the nature of the child in choosing an outfit design, while still appropriate and in-keeping with the bride’s style, so that they love wearing it and totally enjoy their role at the wedding. To give a more grown-up look, we can keep a style a little more simple, nicely fitted, and with clean lines. And then different ages can be linked together, giving a consistent look, by matching fabrics and coloured trims. If somebody wanted you to make something bespoke for them is that possible? How long does it take? A bespoke outfit is the ultimate choice for a special event. We have many design samples at our Pimlico store, which give suggestions of styles we can make with bespoke colours and trims. And I love to design a new couture outfit, working closely with a bride’s ideas. This careful process takes a bit longer than for our classic collections – sourcing special fabrics, buttons and details, so it I best to start planning 4-6 months before the event. Just recently for this winter season, we created heritage pageboy outfits, made as close as possible to resemble a little boy depicted in an 18th Century Romney portrait – this was particularly special to do, as the child in the picture is the boys’ great-great-great-grandfather! What are your new styles for 2016? 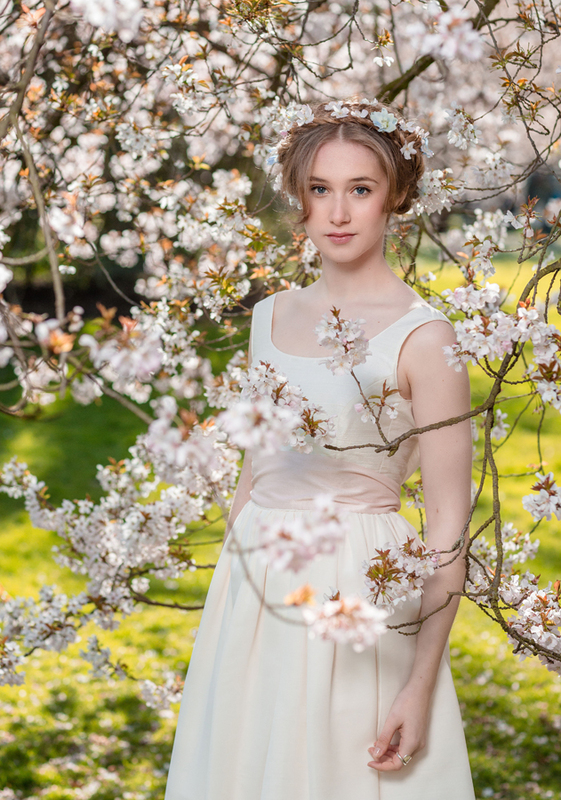 Our classics are ever popular and always kept fresh with a choice of bespoke detailing for every bride. Our Georgian blue ice silk dupion and delicate blush pink are on-trend colours for 2016 spring/summer. And I have added to the design range inspired by ‘Midsummer Night’s Dream’, which were shown on the catwalk at the recent ‘Brides The Show’. Reflecting the magical enchantment of fairy-land, our new dresses are made in ombre silk georgette, and light-as-air organza, all decorated with hand-made silk flowers, and accessorised with a matching fairy wand! What’s next for Little Bevan? I’m very pleased with the imminent launch of our new contemporary website. I can’t wait for the new season’s events where we’ll be showing: The National Wedding Show, Chosen Wedding Fair, London Bridal Fashion Week; and I’m looking forward to the creative collaborations and inspiring design projects that keep me busy! How cute is this ‘Alice in Wonderland’ style dress by Little Bevan? Photograph by Kate Nielen Photography.